If you’ve been meaning to ask “Tell me something interesting about the B-17 Flying Fortress,” then today is your day. The B-17 was a heavy bomber, first built in 1935, that played a major role in World War II, especially in the campaign of daylight bombing against Nazi Germany. It was horrific duty, in which anoxia, frostbite, and burns supplemented gunfire as physical threats to the 10-man crews. Half of all men suffered some degree of anoxia during their combat tours. More were disabled by frostbite than by gunfire – not surprising given the air temperatures of 30-to-50 below zero Fahrenheit, and the large openings in the side of the fuselage through which the waist gunners fired their weapons. Survival in American heavy bombers in the European theater during World War II. Two studies, with some overlap of data. All told, the Air Force (then called the Army Air Force) suffered horrific casualties in its 3.75 years of European combat operations: 20,000 killed, 8400 wounded, and 35,000 missing (ref. : table 86). This does not include psychiatric casualties. Fear was pervasive and severe. The traditional greeting for new arrivals at a bomber base was “You’ll be sorry,” without humor. Psychiatrists found that the effective men were able to convert fear into aggression. All feelings unrelated to combat drained away, and “No values existed other than those meaningful in combat.” Ninety-five per cent of crewmembers developed definite symptoms of “operational fatigue,” 34% suffering severely. At a special rest-and-relaxation base, aviators were routinely put into 3-day medical comas to break their stress. Tragically, the losses were amplified by stupidity at the highest levels of the Air Force. Until late in the war, American fighters were not equipped with extra fuel tanks so they could protect the bombers all the way into Germany and back. Once they were – a simple fix – bomber missions became far more successful and far safer. Hermann Goering feared the war’s outcome was decided as soon as he saw the first American fighter over Germany. 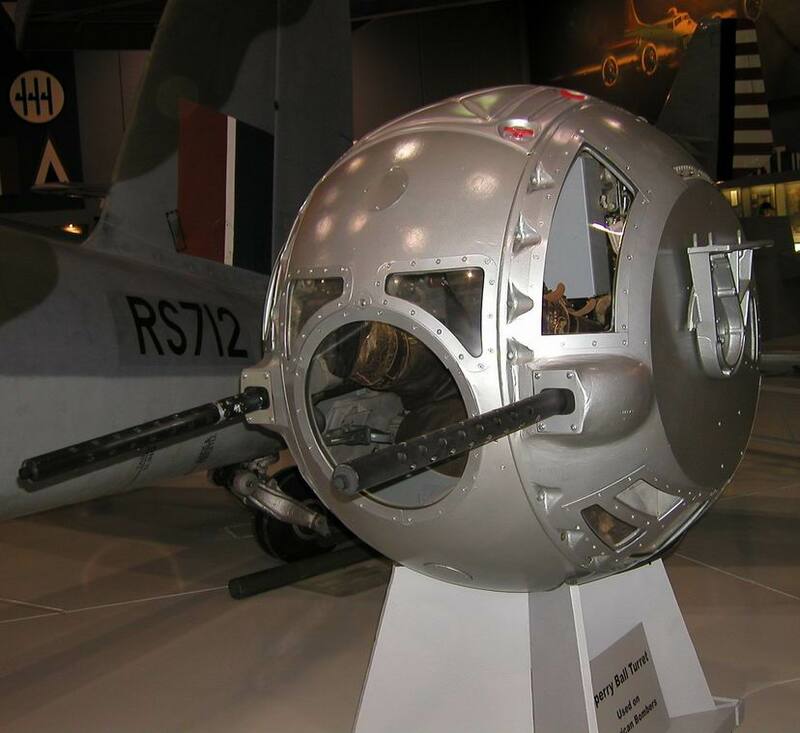 The B-24 also used the same model of ball turret, according to this interesting web page. Here is another good picture of a ball turret module. Apple has announced that the next version of their Macintosh operating system will abandon the tradition of being named after big cats (Jaguar, etc.) and will instead be named “OS X Mavericks,” to commemorate the surfing locale near San Francisco. I’m hoping it’s call signs from Top Gun, which would mean we could look forward to OS X Iceman, OS X Goose, and OS X Joker. OS X Cougar would have nicely bridged big cats and call signs, but that wouldn’t fly today! Two years from now, all true physicians will be applauding the Affordable Care Act. Those who do not will reveal themselves as untrue physicians. A true physician’s first concern is, and must be, the health of his or her patients. The true physician’s second concern is for the public health. Taxes, nanny state worries, and politics are lower on the list, and they do not distinguish a physician from other members of society. Without access to patients, however, physicians cannot work their science-magic. And without access to the health-care system, the public’s disease-fighting options are reduced to lifestyle changes, over-the-counter medications, placebos and barber-surgeons—none of which is going to cure a case of bilobar pneumonia or any other serious illness. Even critics of the Affordable Care Act acknowledge that it will bring health-care access to 30 million Americans. This will save lives — and not just a few. Last year the New England Journal of Medicine published a study showing that, for every million adults added through Medicaid expansion, 5,600 deaths per year were prevented. Extrapolated to 30 million enrollees, that would be akin to curing both malignant melanoma and lupus. Physicians cannot, of course, wholly divorce professional idealism and economic concerns. Nor can society. It is supremely important that compensation in medicine remains high, otherwise the best and brightest will waste their lives in meaningless pursuits of money on Wall Street. Nobody wants a dullard for a doctor. Thus, while it is completely fair for taxpayers to ask whether the Affordable Care Act’s predicted cost savings will occur, physicians must be physicians first, and taxpayers second. No one wants to be fat, yet 73% of our population is. Why? It’s not an exercise problem. Normally, when we humans exert ourselves less, we eat less–our inborn biological mechanisms unconsciously match our food intake to our energy output. Instead, something in modern America has overpowered–one might even use the word “hacked”–these mechanisms. There are many ways to hack our eating controls. Among the simplest is enabling eaters to wolf down calories quickly, before their bodies can chemically perceive that calories have been ingested and generate the “full” feeling that stops eating. Both liquids and processed foods excel at this. It takes about 10 times as long to eat a pound of apples (17 minutes) as to drink a pound of apple juice (1.5 minutes). People eat just 13 grams of raw carrots per minute, versus 130 grams of boiled carrots from a glass container. Two bites of a Big Mac, with its high-fat sauce, will give you far more calories that two heaping forkfuls of red beans and rice. The food industry has done a fantastic job at engineering enticing, inexpensive processed foods that, deliberately or not, confuse our Stone Age satiety mechanisms. Meanwhile, the foods that best suit human physiology–vegetables especially–are so inconvenient and expensive (on a per-calorie basis) that consumers understandably walk past them. Government should implement price incentives to counterbalance evasions of our innate eating controls. Thus, a cap-and-trade system, with “credits” calculated according to nutritional and other characteristics of foods, would make good food available at great prices, and bad foods available at higher prices. Just as importantly, increasing the profit margins on good foods would steer industry’s remarkable talents in a direction that improves American diet, American health, and American waistlines.